Bhagwad Gita made compulsory in Netherlands ? Hoax: Photo is from @ISKCONnews @idtsevaks, probably Russia branch, as the Book Name suggests. Plus it was posted in 2013, so Old Photo. 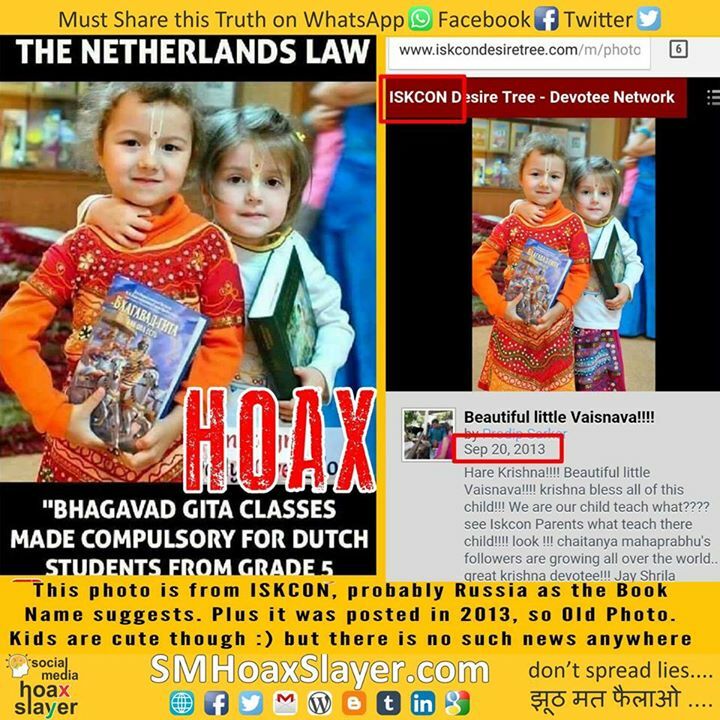 Kids are cute though 🙂 but there is no such news that Netherlands has made Bhagwat Gita compulsory for students in Grade 5 and above anywhere. There is one on Sulekha but it posts it views derived from a paper on Hindu Schools in Netherlands which nowhere mentioned this law. The best it said was about different type of schools in Netherland, Hindu school is part of a lot. But still no compulsion of Bhagwat Gita at all. Netherland Government Official website has a list of compulsory subjects which doesn’t have it. Here is the list of compulsory subjects posted on Official Netherlands Government website which doesn’t have it.